Running and gardening seasons are coming to a seasonal close. This, in concert with a low head count at my Saturday morning yoga classes, is affording me some time to ponder my yoga teaching and practice. I’ve decided to go back to one of my earlier teachers, Paul, and take a session of his classes to see if his tradition (Iyengar) and style give me some new things to think about. The very first pose (asana) we did, after the opening meditation, was headstand (salamba sirsasana). Even when I took his classes years ago, we wouldn’t do headstand until at least halfway through the class. Given how many years it took my confidence and neck/shoulder strength to do this pose, I read this timing to mean that those parts needed to be warmed up before stressing the spine and next in that manner. Maybe it’s not so: it was kind of fun and definitely energizing to do that work early in the class. There is a heart bandha, or energy lock/valve; evidently it’s corollary to the three basic bandhas. While my practice and teaching often includes cues to set the shoulders, shoulder blades and chest in the same manner, I don’t recall ever thinking of of it as a bandha, but it makes perfect sense to think of it in energy flow (pranic) terms, in addition to anatomical efficiency/safety. Sun Salutations – Surya Namaskar – were done closer to the end of the class, as a moving meditation. I’ve experienced it most often near the beginning of a class, used as a warm-up for the more intense poses to come. I found it centering and peaceful to do this series later in an evening practice. As expected, I did achieve more … tangible … relaxation. This was expected as the style I teach and practice now, Vinyasa, goes about relaxation from a different angle that I find even more challenging. The main difference is simple time: on Friday, we were likely in final relaxation pose for at least five, if not ten minutes. Paul asked me at the end of the class if I had any questions. I was still soaking the evening’s experience up, and wanted to wait a few days before forming any comparisons or illuminations to share. Today, this is what I have. 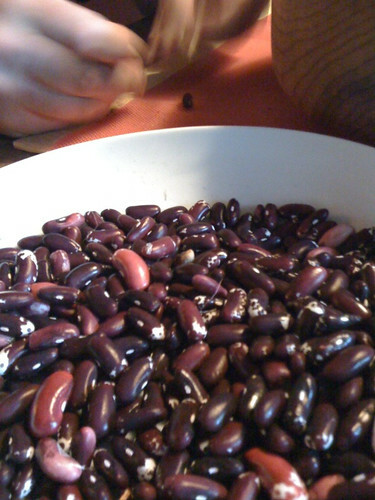 This, and the photo of the beauteous beans we grew, this year. What I love most about these is that we don’t feel rushed to eat them before they spoil: they are dried beans. It just feels so right, to grow them in a state where we have so many non-growing months. I also love how large beans are, compared to so many other of the vegetable and herb seeds I’ve planted over the last few years. These are just big, fat, wine-colored symbols of life, continuity, growth, birth, and security. To grow them makes me smile and makes me feel good about what I’m doing with this life in general.